New Program to Benefit Gilman! 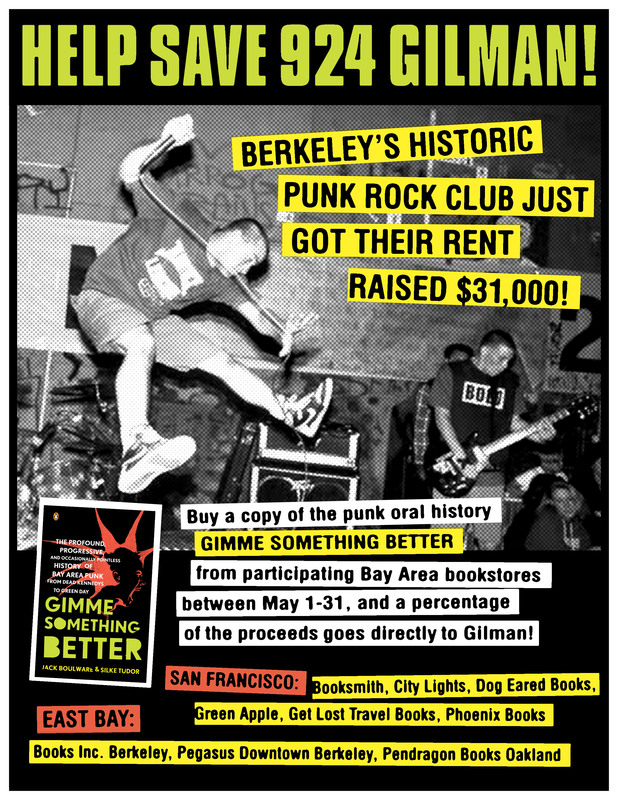 SAN FRANCISCO — On July 1st, 2010 the legendary Berkeley all-ages music club 924 Gilman faces a very large and unexpected rent increase, nearly $3,000 per month. The venue is now struggling to generate an extra $31,000 a year needed to cover the massive rent hike. 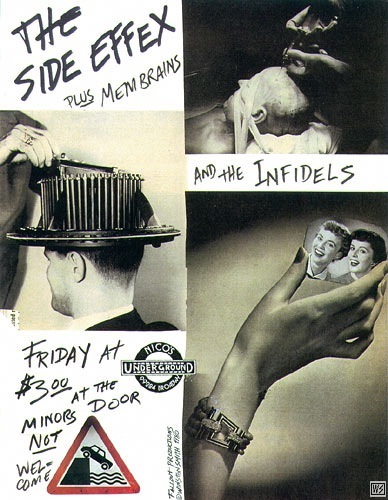 Outside of New York and London, California’s Bay Area claims the oldest continuous punk rock scene in the world — from the innovative late-70s art-damage of San Francisco’s Fab Mab in North Beach, to the still vibrant all-ages DIY ethos of Gilman, where bands like Green Day, Rancid, and AFI got their start. Conceived and managed by an all-volunteer community, Gilman has been in operation for over 23 years, providing inspiration and empowerment for Bay Area youth, as well as music fans around the world. 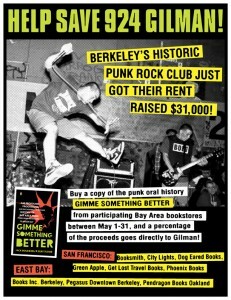 Starting May 1st and continuing throughout the month of May, select independent bookstores in the Bay Area will donate a percentage of sales of the oral history book, “GIMME SOMETHING BETTER: The Profound, Progressive, and Occasionally Pointless History of Bay Area Punk from Dead Kennedys to Green Day,” by Jack Boulware & Silke Tudor. A percentage of the book’s proceeds will be donated to 924 Gilman to help keep this important venue from suffering the same fate as New York’s CBGB’s, which is now a clothing store. Participating bookstores already include: Pegasus Books, Dog Eared Books, Green Apple Books, Get Lost Books, City Lights, Booksmith, Phoenix Books (SF), Books Inc. Berkeley, Pegasus Downtown Berkeley, Pendragon Books Oakland (East Bay). CLICK HERE for stores’ contact info and location. Or send checks to: Alternative Music Foundation, P.O. Box 1058, Berkeley, CA. 94701. GIMME SOMETHING BETTER represents the definitive chronicle of Bay Area punk music, progressive politics, social consciousness, and divine decadence. The book features black and white photographs throughout, an exhaustive who’s-who list, and an introduction by Jesse Michaels, famed singer of Operation Ivy. This entry was posted on Tuesday, April 27th, 2010 at 12:34 pm	and is filed under News. You can follow any responses to this entry through the RSS 2.0 feed. Both comments and pings are currently closed.